Knitting expert Kari Cornell teaches you how to make your own baby knits in all of the world's authentic traditions.Baby Knits from Around the World showcases 20 designs by well-known artisans hailing from classic knitting traditions in Scandinavia, Ireland, Scotland, England, the Baltics, Europe, South America, and North America. 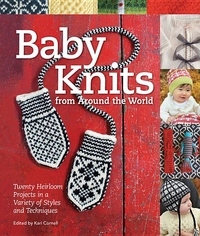 This book includes detailed instructions for ever-popular baby hats, blankets, sweaters, booties, pants, dresses, toys, and mitts; while introductions to each pattern detail the history of the technique that the design employs. With over 100 gorgeous photos and diagrams throughout, knitters of all proficiency levels are sure to enjoy Kari Cornell's hand-picked collection of baby knitting projects.